Win a Caribbean Vacation in Northern Canada! What Turkey and Syria are to Europe, Jamaica and Trinidad are to northern Canada! It’s never been more fun de-stabilizing, de-nationalizing and, indeed, de-Christianizing! Unashamed paganism galore to make Las Vegas blush! Now you can be a part of Marxist Multiculturalism! Take a Carribean vacation in northern Canada! Enjoy Trotsky’s euphoria for free! The festivities are what you make of them! Short-term gain for long-term pain! For only a plane ticket or gas in your car, you can now win entry into Canada’s destruction! Yes, Trotsky invented “racism” to gain the moral high ground, so you and everyone would experience endless false guilt when opposing his multicultural program. Of course, the word “racist” was never in the Bible and even Shakespeare didn’t think of it, in the over 1500 words he invented. You must always feel guilty about opposing Marx’s conquest through immigration! “Nationalism was never meant to be permanent,” swore the late 19th-century atheist and occult socialists. The Magna Carta and U.S. Constitution, the greatest documents of mankind, in their socialist eyes were only to be temporary, to be dominated by a draconian, borderless, world government. A major benefit to globalists of Trotsky’s Marxist Multiculturalism is “Mongrelization.” Let it be firmly understood this is a globalist-elite term, paramount in their social engineering schemes for control. 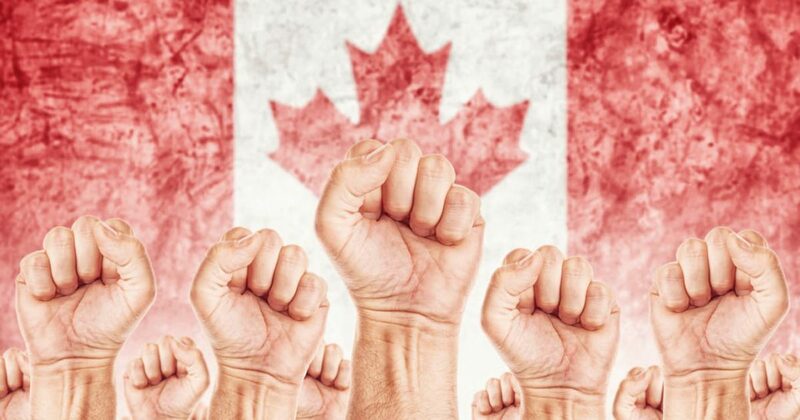 A primary way to destroy the North American middle class, their coveted “mongrelization” agenda of blacks marrying whites is now deeply entrenched in Canada. Once again, Canadian Prime Minister Justin Trudeau – who said “Christians are the lowest element of Canadian society” – defies Christianity with this publicly-funded display of paganism. No need for “natural man” reprobates to assimilate to Canada! They are fine as they are! The more the merrier! For all contribute to the ensuing “Ordo Ab Chao,” so critical to the implementation of a New World Order minus the middle class (formerly the bulwark against tyranny). And now, without further ado, enjoy your Carribean vacation to northern Canada! Click here! The destruction of Canadian nationalism has never been more fun! Experience the momentary liberalism of Europeans who welcomed their invaders… until they were subjugated, tormented, “mongrelized” globalist style, and destroyed.